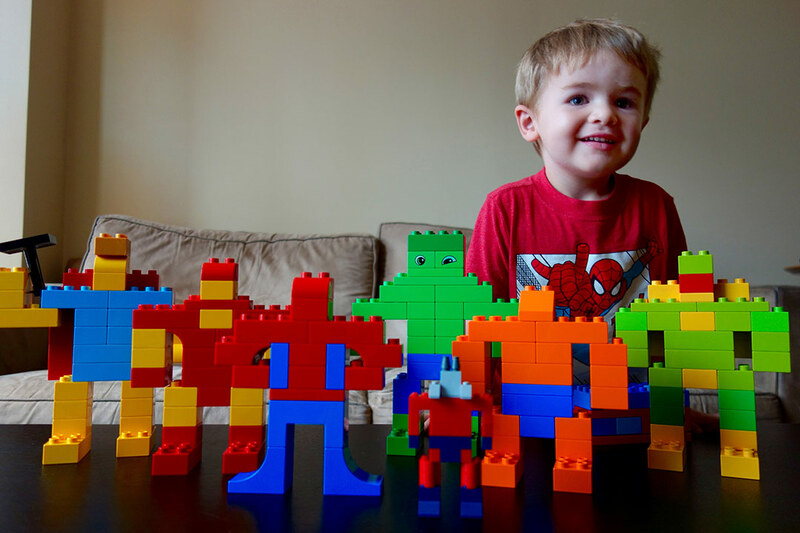 Inspired by Henry’s earlier foray into superhero construction, we built as many Marvel characters as we could out of his Lego/Duplo blocks. We attended the annual food fest, Taste of Tribeca, in our neighborhood on Saturday. This was Henry’s third time attending and our eighth. This is one of our favorite yearly events and it is also a chance to support the local schools. Henry was Spiderman for the day and enjoyed wearing the sword he received from a nice lady making balloon animals for the kids. Henry’s become a big fan of superheros so we took a trip to Philadelphia with John, Kim and Eamonn to attend the Wizard World Comic Con on Saturday. Henry sings the Spiderman theme song over and over. Most times Spiderman and Superman are interchangeable. He really just enjoys talking now that he can do it so well.